Calling all nut butter lovers! This Chocolate Almond Butter Mousse Pie is a must try! It starts with a date-sweetened almond pecan crust. Then it’s filled with a luxurious almond butter chocolate mousse. This pie may have a few steps to make it, but it’s completely no-bake and very simple despite the long instruction list. It’s worth every minute. This pie kind of reminded me of my chocolate mousse pie. It’s also similar to my chocolate pumpkin mousse pie. You really can’t go wrong when you are talking about any chocolate mousse! 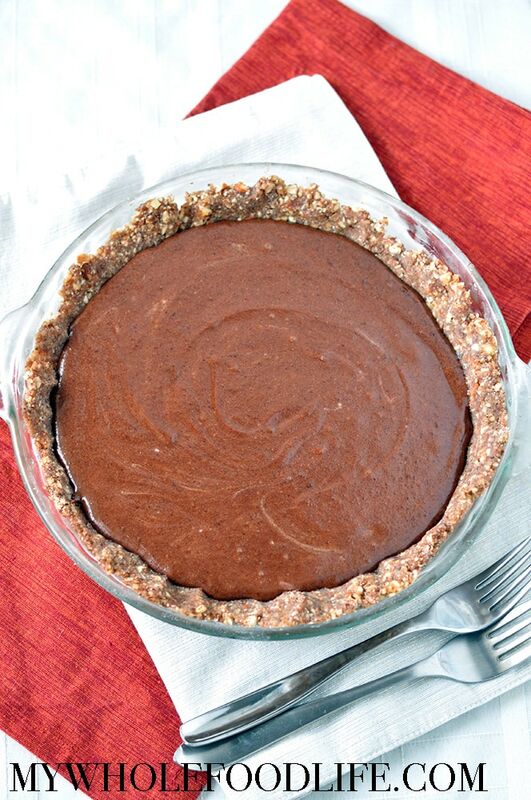 This rich and creamy pie is no-bake, vegan, gluten free AND paleo approved! So it’s basically for everyone and needs to be a staple at your holiday dessert party. Trust me! I hope you enjoy it as much as we did! If you need a nut-free version, you can make the crust out of sunflower and pumpkin seeds and then use sunflower butter in the filling. Another great idea would be to sprinkle some coarse ground sea salt on top. Yum! I will be trying that next time for sure! We also filmed this short video on how to make this pie. Super rich and creamy chocolate almond butter mousse pie. Vegan, gluten free AND paleo approved! Nut free option in the post as well. In a food processor , combine the almonds, pecans and dates. Blend until the mixture comes together. You may need to add a few drops of water to make it stick. Once you have a sticky mixture, press it into a greased pie plate . Place in the fridge to set while you make the filling. In a small sauce pan , heat the almond butter, chocolate chips, cacao powder, 2 T maple syrup and almond milk. Stir until the chips are melted and everything is well mixed. Set aside. Open the can of refrigerated coconut milk and scoop the fatty white part out into a mixing bowl with the other 2 T maple syrup . You can save the remaining water for smoothies. Using the whipping attachment on your mixer , whip the into a cream. Once it looks creamy, you can gently fold the chocolate mixture until everything is mixed together well. Pour the finished mixture into the crust and place back in the fridge to set. It should set in about 1 hour. This should last at least 2 weeks in the fridge. You can also freeze it for longer. Enjoy! I am allergic to walnuts and pecans. Any ideas what I could substitute with? Thank you so much for sharing this! My husband has to gain 30 pounds (post treatment for cancer) and I need lots of high calorie, somewhat healthy foods. This one should work - will be making it tomorrow. You are so welcome Nancy! Wishing your husband a speedy recovery! Thanks, Melissa. I just put the pie in the fridge to set and licked the bowl. YUM!!!! I hope he likes it because I can definitely see myself eating this entire pie! MY HUSBAND LOOOOOVES IT!!! The consistency is perfect for him (lost most of his saliva from radiation treatment). I will definitely this recipe with vegan and head &a neck cancer groups. YAY! I am so happy to hear that. Melissa I have seen several recipes asking yyou to refrigerate the coconut milk and remove the cream. Mine never has thick cream like that. There is usually only a 1/4 of cream harder at the top. Is it because I buy the kind without gar gumgum? I'm not sure. Are you buying Native Forest? I have horrible luck with that brand. That's why I stick with Thai Organic. This looks amazing!!! I have everything to make this EXCEPT for the pecans. Do you think I could make it solely with almonds for the crust? I never soak my grains, but a lot of people do. They are supposedly easier to digest if you do. Do the nuts need to be soaked over night? Do you think I could make this with an all pistachio crust or a mix of almonds and pistachios? Yes. That would be yummy! Really really yummy recipe. I just love chocolate. Do you have to soak the dates in water first? I have canned coconut cream on hand. If I use that instead of separating coconut milk and using its cream, how much do you think I should use? Very excited to try this! Thanks! If I had to guess, I would say 1 cup? The coconut milk helps create a mousse-like texture. If you are not vegan, you can whip heavy cream instead of full fat coconut milk. Can I use cocoa powder instead of Safeco powder? Yes you can. :) Same amount. Hi! I'm making his right now & my coconut milk didn't firm up in the fridge, I had it in there all day & night. Any suggestions? Some brands aren't as good as others. Did you use full fat coconut milk? The low fat version will not work. Also, I find that the Thai Kitchen brand works best. That's the brand I bought. Not sure what happened. I put it in the freezer and that seemed to help. Still looks good so I'm going with it. Happy Thanksgiving!